Hay is any grass, legume, or other herbaceous plant, cultivated or wild, that has been cut and dried for use as fodder for domestic livestock, particularly for grazing animals like cattle, horses, goats, and sheep. However, hay may also find application as animal feed for wild animals (deer, elk), as mulch, or as animal bedding, among other uses. Small pets such as guinea pigs and rabbits also eat hay, though they consume only very small quantities. Pigs may be fed hay, but they do not digest hay very efficiently. Hay is utilized as the principal or supplementary feed for animals when or where there is not enough pasture or rangeland on which the animals can freely graze or when grazing is unavailable due to weather—such as during the winter, or when lush pasture by itself is too rich for easy digestion by the animal. Hay is also provided during times when an animal is unable to access pasture, such as when animals are kept in a stable or barn. Alfalfa, clover, and timothy-grass are particularly popular as hay crops. After mowing and drying, the hay may be stored loose or compressed into tight bales for later use, with storage possible for months if properly dried. Developing over time the procedures and technologies for making and preserving hay has been a contribution to the advancement of human society of the same order as domesticating animals and developing diverse breeds and cultivars of plants. Once a job done by hand, baling hay (making the bales of hay) is highly mechanized on modern farms, which use machinery that may be capable of producing and handling bales weighing up to 3,000 pounds. Good quality hay should be green, not too coarse, and contain plant heads and leaves as well as stems. This is fresh grass/alfalfa hay, newly baled. Commonly used plants for hay include mixtures of grasses, such as rye grass (Italian rye grass, Lolium multiflorum), Timothy-grass, brome, fescue, coastal bermuda, orchard grass, and other native species, depending on the region. Many types of hay may also include legumes, such as alfalfa (lucerne) and clovers (red, white and subterraneum). Pasture flowers are also sometimes a part of the mix, though other than legumes, which ideally are cut pre-bloom, flowers are not necessarily desired, and in some cases may be toxic to animals. Cereal crops like oat, barley, and wheat are occasionally seen in hay products, though usually in the form of straw, a harvest byproduct where only the stems are dried and baled after the grain is harvested. Straw is used for animal bedding and generally is considered poor animal fodder, though sometimes it is used as a source of empty calories to give animals a feeling of fullness or satiety when on an otherwise restricted diet. It is the leaf and seed material in the hay that determines its quality. Farmers try to harvest hay at the point when the seed heads are not quite ripe and the leaf is at its maximum when the grass is mowed in the field. The cut material is allowed to dry, either in the field or mechanically, so that the bulk of the moisture is removed but the leafy material is still robust enough to be picked up from the ground by machinery and processed into storage in bales, stacks, or pits. Poor quality hay is dry, bleached out, and coarse-stemmed. Sometimes, hay stored outdoors will look like this on the outside but still be green inside the bale. A dried, bleached, or coarse bale is still edible and provides some nutritional value as long as it is dry and not moldy, dusty, or rotting. Hay is very sensitive to weather conditions, particularly when it is harvested. In drought conditions, both seed and leaf production are stunted, making hay that has a high ratio of dry coarse stems that have very low nutritional values. If the weather is too wet, the cut hay may spoil in the field before it can be baled. The hay may also develop rot and mold after being baled, creating the potential for toxins to form in the feed, which could make the animals sick. It also has to be stored in a manner to prevent it from getting wet. Mold and spoilage reduce nutritional value and may cause illness in animals. The successful harvest of maximum yields of high-quality hay is entirely dependent on the coincident occurrence of optimum crop, field, and weather conditions. When this occurs, there may be a period of intense activity on the hay farm while harvest proceeds until weather conditions become unfavorable. In various Northern temperate countries, the "summer vacation" period when public schools would close was by tradition to enable farm children to assist in the family hay harvest, as well as the harvest of other crops. This tradition is entrenched to the present day, even though only a very small fraction of school-aged children today in developed countries live on livestock farms. Hay or grass is the foundation of the diet for all grazing animals and can provide as much as 100 percent of the fodder required for domestic livestock. Hay is usually fed to an animal in place of allowing the animal to graze on grasses in a pasture, particularly in the winter or during times when drought or other conditions make pasture unavailable. Animals that can eat hay vary in the types of grasses suitable for consumption, the ways they consume hay, and how they digest it. Therefore, different types of animals require hay that consists of similar plants to what they would eat while grazing, and likewise, plants that are toxic to an animal in pasture generally also are toxic if they are dried into hay. (However, the toxicity of cowbane, notoriously poisonous to cattle, has the toxicity of its stems significantly decreased when dried). Most animals are fed hay in two daily feedings, morning and evening. However, this schedule is more for the convenience of humans, as most grazing animals on pasture naturally consume fodder in multiple feedings throughout the day. Some animals, especially those being raised for meat, may be given enough hay that they simply are able to eat all day. Other animals, especially those that are ridden or driven as working animals, are only free to eat when not working, and may be given a more limited amount of hay in order to prevent them from getting too fat. The proper amount of hay and the type of hay required varies somewhat between different species. Some animals also are fed concentrated feeds such as grain or vitamin supplements in addition to hay. In most cases, hay or pasture forage must make up 50 percent or more of the diet by weight. One of the most significant differences in hay digestion is between ruminant animals, such as cattle and sheep, and non-ruminant, hindgut fermentors, such as horses. Both types of animals can digest cellulose in grass and hay, but do so by different mechanisms. In general, animals rely on symbiotic microorganisms to digest cellulose, while they rely on enzymatic actions to digest carbohydrates, fat, and protein (OMAFRA 2008). Non-ruminants like people, dogs, and pigs, digest carbohydrates, protein, and fat by enzymatic action and cannot digest cellulose. Cattle digest fiber in stages, with the first stage after mastication involving activity of symbiotic microorganisms in the fore stomachs and a later stage involving enzymatic digestion in the small intestines (OMAFRA 2008). The horse digestive system is somewhat between that of ruminants and non-ruminants as forage passes through the esophagus, stomach, and small intestine before it is digested in the hind gut—the cecum and colon—where large microbial populations break down the fibrous material, such as from hay and pasture grass, in a way similar to that used by cattle (Evans and McKendrick 2006: OMAFRA 2008). Simple carbohydrates, such as starch from grain, are digested by enzymatic action in the foregut of horses (Evans and McKendrick 2006). The size of the horse lower gut makes the horse well-suited to subsist primarily on forages. Proper functioning of the horse digestive tract requires a minimum of one percent of the animal's body weight per day in long-stem dry matter (Russell and Johnson 1993). The four-chambered stomach of cattle often permits them to break down older forage and have more tolerance of mold and changes in diet than other ruminants or horses. This occurs because any mold that may be in hay eaten by cattle is broken down and made nontoxic when it first enters the digestive tract. In horses the mold in hay passes first through the stomach and small intestine where the mold toxins can cause digestive problems, and only after that are the toxins broken down in the cecum (Evans and McKendrick 2006). Horses thus require hay of a more consistent type and quality. Different animals also utilize hay in different ways: Cattle are adapted to eat forage in relatively large quantities at a single feeding, and then, due to the process of rumination, take a considerable amount of time for their stomachs to digest food, often accomplished while the animal is lying down, at rest. Quantity of hay is important for cattle, who are able to effectively digest hay of low quality if fed in sufficient amounts. Sheep will eat between two and four percent of their body weight per day in dry feed, such as hay (Schoenian 2003), and are very efficient at obtaining the most nutrition possible from three to five pounds per day of hay or other forage (Umberger 1996). They require three to four hours per day to eat enough hay to meet their nutritional requirements (Neary and Johnson 1991). Unlike ruminants, horses digest food in small portions throughout the day, and can only utilize approximately 2.5 percent of their body weight in feed in any 24 hour period. They are adapted to be continuously on the move while grazing, (covering up to 50 miles-per-day in the wild) and their stomach digests food quite rapidly. Thus, they extract more nutrition out of smaller quantities of feed (Budiansky 1997). 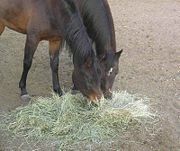 When horses are fed low-quality hay, they may develop an unhealthy, obese, "hay belly" due to over-consumption of "empty" calories. If their type of feed is changed dramatically, or if they are fed moldy hay or hay containing toxic plants, they can become ill; colic is a leading cause of death in horses. Hay production and harvest involves a multiple step process: cutting, drying or "curing," processing, and storing. Hay fields do not have to be reseeded each year in the way that grain crop fields are, but regular fertilizing is usually desirable, and over-seeding a field every few years helps increase yield. Methods and the terminology to describe the steps of making hay have varied greatly throughout history, and many regional variations still exist today. However, making hay is done by hand or by modern mechanized equipment, the procedure requires that tall grass and legumes at the proper stage of maturity must be cut, then allowed to dry (most commonly by the sun, but mechanical methods have been developed), then raked into long, narrow piles known as windrows. Next, the cured hay is gathered up in some form (usually by some type of baling process) and placed for storage into a haystack or into a barn or shed to protect it from moisture and rot. "Cutting." During the growing season, which is spring and early summer in temperate climates, grass grows at a fast pace. It is at its greatest nutritive value when all leaves are fully developed and seed or flower heads are just a bit short of full maturity. When growth is at a maximum in the pasture, if judged correctly, the pasture is cut. Hay that has been cut too early will not cure as easily due to high moisture content, plus it will produce a lower yield-per-acre than longer, more mature grass. But hay cut too late is coarser, lower in resale value, and has lost some of its nutrients. There is usually about a two-week "window" of time in which hay is at its ideal stage for harvesting. "Drying or curing." Effort is made to dry the hay uniformly and quickly to retain maximum nutrition and palatability. Hay can be raked into rows as it is cut, then turned periodically to dry, particularly if a modern swather is used. Or, especially with older equipment or methods, the hay is cut and allowed to lie spread out in the field until it is dry, then raked into rows for processing into bales afterwards. During the drying period, which can take several days, the process is usually speeded up by turning the cut hay over with a hay rake or spreading it out with a tedder. If it rains while the hay is drying, turning the windrow can also allow it to dry faster. However, turning the hay too often or too roughly can also cause drying leaf matter to fall off, reducing the nutrients available to animals. Too much exposure to the sun can also reduce nutritive value, and if there is too much rain, the hay can spoil in the field or develop mold or rot. Drying can also be speeded up by mechanized processes, such as the use of a hay conditioner, or by use of chemicals sprayed onto the hay to speed evaporation of moisture. However, these are more expensive techniques, not in general use except in areas where there is a combination of modern technology, high prices for hay, and too much rain for hay to dry properly (Shinners and Schuler 2003). "Processing." Once hay is cut, dried, and raked into windrows, it is usually gathered into bales or bundles, then hauled to a central location for storage. Common procedures include compressing hay into cylindrical or rectangular bales, which are held together by twine. In some places, depending on geography, region, climate, and culture, hay is gathered loose and stacked without being baled first. "Storage." Hay must be kept dry in storage or it may rot or develop mold. The moisture content of stacked hay also must be kept lower than 22 percent to avoid a significant risk of spontaneous combustion (Cash and Johnson 1999). Hay stored outside must be stacked in such a way that moisture contact is minimal. 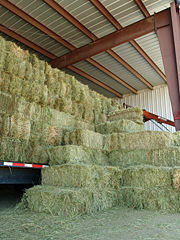 Some stacks are arranged in such a manner that the hay itself "sheds" water when it falls. Other methods of stacking use the first layers or bales of hay as a cover to protect the rest. To completely keep out moisture, outside haystacks can also be covered by tarps, and many round bales are partially wrapped in plastic as part of the baling process. Hay is also stored under a roof when resources permit. It is frequently placed inside sheds, or stacked inside of a barn. Care must be taken that hay stored inside is never exposed to any possible source of heat or flame: both dry hay and the dust it produces are highly flammable. Early farmers noticed that growing fields produced more fodder in the spring than the animals could consume, and that cutting the grass in the summer, allowing it to dry, and storing it for the winter provided their domesticated animals with better quality nutrition than simply allowing them to dig through snow in the winter to find dried grass. Therefore, some fields were "shut up" for hay. By the twentieth century, good forage management techniques demonstrated that highly productive pastures were a mix of grasses and legumes. Later still, some farmers grew crops, like straight alfalfa (lucerne), for special-purpose hay such as that fed to dairy cattle. Much hay was originally cut by scythe by teams of workers and gathered up into sheaves by hand. It was placed into stooks or "shocks" in the field until it could be gathered up for storage. Later, haying would be done by horse-drawn implements such as mowers and binders. With the invention of agricultural machinery such as the tractor and the baler, most hay production became mechanized by the 1930s. After hay was cut and had dried, the hay was raked or "rowed up" by raking it into a linear heap by hand or with a horse-drawn implement. Turning hay, when needed, originally was done by hand with a fork or rake. Once the dried hay was rowed up, it was gathered into a type of wagon called a hay rack (or "hay rick"). In early days, this was done by forking it into a horsedrawn cart or dray or onto a truck, later by a sweep attached to a truck or tractor. Alternatively, the loose hay could be put into stooks or shocks before being collected. Loose hay was taken to an area designated for storage—usually a slightly raised area for drainage—and built into a hay stack. The stack was made waterproof as it was built (a task of considerable skill) and the hay would compress under its own weight and cure by the release of heat from the residual moisture in the hay and from the compression forces. The stack was fenced from the rest of the paddock. When needed the haystack would be cut open, using a hay-knife, and some would be fed out to animals each day. On some farms, the loose hay was stored in a shed or barn, normally in such a way that it would compress down and cure. Hay could be stored in the second floor of the barn above the animals or in a specially designed barn with little internal structure to allow more room for the hay. Depending on region, the term "hay rick" could refer to the machine for cutting hay, the hay stack, or the wagon used to collect the hay. Different balers can produce hay bales in different sizes and shapes. Here two different balers were used to create both large round bales and smaller rectangular bales. Mobile balers, machines that gather and bale hay in one process, were first developed around 1940. The first balers produced rectangular bales small enough for a person to lift, usually between 70 and 100 pounds each. 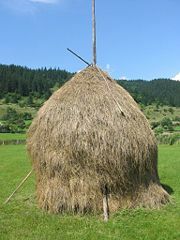 The size and shape made it possible for people to pick bales up, stack them on a vehicle for transport to a storage area, then build a haystack by hand. However, to save labor and increase safety, loaders and stackers were also developed to mechanize the transport of small bales from the field to the haystack. Later, balers were developed capable of producing large bales that weigh up to 3,000 pounds (Hires 1981). When possible, hay, especially small rectangular bales like these, should be stored under cover and protected from the elements. Small bales are still produced today. While balers, loaders, and stackers for small bales are still manufactured, some farms still use equipment manufactured over 50 years ago, kept in good repair. The small bale remains part of overall ranch lore and tradition with "hay bucking" competitions still held for fun at many rodeos and county fairs. Small bales are stacked in a criss-crossed fashion sometimes called a "rick" or "hayrick." Since rain washes nutrition out of the hay and can cause spoilage or mold, hay in small bales is often stored in a hayshed or protected by tarpaulins. If this is not done, the top two layers of the stack are often lost to rot and mold, and if the stack is not arranged in a proper hayrick, moisture can seep even deeper into the stack. People who own small numbers of livestock, particularly horses, still prefer small bales that can be handled by one person without machinery. There is also a risk that hay baled while still too damp can produce mold inside the bale, or that decaying carcasses of small creatures that were accidentally killed by baling equipment and swept up into the bales can produce toxins, such as botulism. Both can be deadly to non-ruminant herbivores, such as horses, and when this occurs, the entire contaminated bale should be thrown out, another reason some livestock owners continue to support the market for small bales. Many farmers, particularly those who feed large herds, have moved to balers that produce much larger bales, maximizing the amount of hay that is protected from the elements. Large bales come in two types, round and square. "Large Square" bales, which can weigh up to 1,000 kg (2,200 lb), can be stacked and are easier to transport on trucks. Round bales, which typically weigh 300–400 kg (700–900 lb), are more moisture-resistant, and pack the hay more densely (especially at the center). Round bales are quickly fed with the use of mechanized equipment. The ratio of volume to surface area makes it possible for many dry-area farmers to leave large bales outside until they are consumed. Wet-area farmers and those in climates with heavy snowfall usually stack round bales under a shed or tarp, but have also developed a light but durable plastic wrap that partially encloses bales left outside. The wrap repels moisture, but leaves the ends of the bale exposed so that the hay itself can "breathe" and does not begin to ferment. However, round bales stored under a shed last longer and are less likely to be lost to rot and moisture (Rayburn). For animals that eat silage, a bale wrapper may be used to seal a round bale completely and trigger the fermentation process. It is a technique used as a money-saving process by producers who do not have access to a silo, and for producing silage that is transported to other locations. However, a silo is still a preferred method for making silage (Garthe and Hall). In very damp climates, it is a legitimate alternative to drying hay completely and when processed properly, the natural fermentation process prevents mold and rot. Round bale silage is also sometimes called "haylage," and is seen more commonly in Europe than in either the United States or Australia. However, hay stored in this fashion must remain completely sealed in plastic, as any holes or tears can stop the preservation properties of fermentation and lead to spoilage (Spivey and Nix 2006). Haystacks produce internal heat due to bacterial fermentation. If the hay was baled from moist grass, the heat produced can be enough to set the haystack on fire. Even today, farmers have to be careful about moisture levels to avoid this "spontaneous combustion," because haystack fires can be very dangerous (Cash and Johnson 1999). Due to its weight, hay in general can cause a number of injuries to humans related to lifting and throwing bales. Likewise, there are risks related to stacking and storing, such as the danger of having a poorly-constructed stack collapse, causing either falls to people on the stack or injuries to people on the ground who are struck by falling bales. Large round hay bales present a particular danger to those who handle them because they can weigh over a thousand pounds and cannot be moved without specialized equipment. Nonetheless, because they are cylindrical in shape, and thus can roll easily, it is not uncommon for them to fall from stacks or roll off from equipment used to handle them. From 1992 to 1998, 74 farm workers in the United States were killed in large round hay bale accidents, usually when bales were being moved from one location to another, such as when feeding livestock (CDC 2001; Wahl et al. 1998). Hay is generally one of the safest feeds to provide to domesticated grazing herbivores. However, some precautions are needed. The amount of hay provided to the animals must be monitored so that animals do not get too fat or too thin. Supplemental feed may be required for working animals with high energy requirements. Some plants themselves may also be toxic to some animals. For example, Pimelea, a native Australian plant, also known as flax weed, is highly toxic to cattle (Plate 2006). Budiansky, S. 1997. The Nature of Horses. Free Press. ISBN 0684827689. Cash, D., and R. Johnson. 1999. Keeping hay fires from spontaneously combusting. Montanan State University Communication Services. Retrieved April 24, 2008. Centers for Disease Control (CDC). 2001. Hazards associated with using farm tractors to move large bales. Centers for Disease Control. Retrieved September 10, 2004. Evans, P., and S. McKendrick. 2006. Equine nutrition: Forages. Utah State University. Retrieved April 23, 2008. Garthe, J. W., and M. H. Hall. n.d. Large round bale silage. Penn State College of Agricultural Sciences Cooperative Extension Service. Retrieved April 23, 2008. Hires, W. G. 1981. Large round bales: Management. Publication no. G1955, University of Missouri Extension. Retrieved April 23, 2008. Neary, M., and K. Johnson. 1991. Stretching hay supplies. Indiana Sheep Tales, vol. 2. Purdue University. Retrieved April 23, 2008. Ontario Ministry of Agriculture, Food and Rural Affairs (OMAFRA). 2008. Equine digestive tract structure and function. Ontario Ministry of Agriculture, Food and Rural Affairs. Retrieved April 23, 2008. Plate, A. 2006. Toxic weed kills cattle. ABC Rural. Retrieved April 23, 2008. Rayburn, E. B. n.d. Round bale storage costs. West Virginia University Extension Service. Retrieved April 23, 2008. Russell, M. A., and K. D. Johnson. 1993. Selecting hay for horses. Cooperative Extension Service, Purdue University. Retrieved April 23, 2008. Schoenian, S. 2003. An introduction to feeding small ruminants. Western Maryland Research & Education Center, Maryland Cooperative Extension Service. Retrieved April 23, 2008. Shinners, K. J. and R. T. Schuler. 2003. Equipment to rake and merge hay and forage. The University of Wisconsin-Extension. Retrieved April 23, 2008. Spivey, K., and J. Nix. 2006. Haylage. North Carolina State University Cooperative Extension Service. Retrieved April 23, 2008. Umberger, S. H. 1996. Information on feeding sheep. Virginia Cooperative Extension Publication Number 410-853. Retrieved April 24, 2008. Wahl, G. L., M. Brown, and D. L. Parker. 1998. Fatalities associated with large round hay bales: Minnesota, 1994-1996. Journal of the American Medical Association (JAMA) 279:647-649. Retrieved April 24, 2008. Wright, B., and D. Kenney. 2005. Abortion in horses. "Queen's Printer for Ontario Fact Sheet no. 05-061. Ontario Ministry of Agriculture, Food and Rural Affairs." Retrieved April 23, 2008. This page was last modified on 21 August 2008, at 16:37.